Gas is one of the most import commodities in the United States. We’re a large, spread out country and we’re always on the go. That means we need cars and trucks to quickly take us to our destination. The problem is, gas isn’t cheap. If you want to save on gas prices, look at the map below and see which gas station chain offers the lowest price in your state. Inside of every state on the map there are the name and logo of the gas station chain that offers the lowest gas prices in that state. There are three tiers of gas prices: states that are dark green have gas chains that offer between $2.50 and $2.99 per gallon of gas, states that are just green prices between $2.00 and $2.49 per gallon and states that are light green offer prices between $1.50 and $1.99 per gallon. The data were collected from Business Insider. To determine the list, BI analyzed information from GasBuddy.com’s lists of Top Ten Lowest Gas prices in every state; this information is based on daily input from its 60,000,000 plus users and is subject to change. States with gas chains that offer high prices per gallon tend to lie within the Northwest region of the United States, although there are some exceptions. New York, Pennsylvania, Maine and Vermont all lie within the highest tier of prices. One reason states in the Northwest have higher gas prices may be due to Hurricane Harvey, according to GasBuddy and Oil Price Information Service. But there are states outside of the Northeast that don’t get hit by hurricanes, but still have high gas prices. Both Alaska and Hawaii have the highest gas prices, but that is likely due to how remote those states are. The chain that offers the lowest prices in Hawaii is Freedom at $2.92 per gallon, which is the highest price for gas in the country. California is neither remote nor suffers from hurricanes, yet the chain with lowest gas prices in California is the third highest in the country at $2.73 per gallon. One trend to notice is the prevalence of the chain wholesale company Costco found throughout the country. 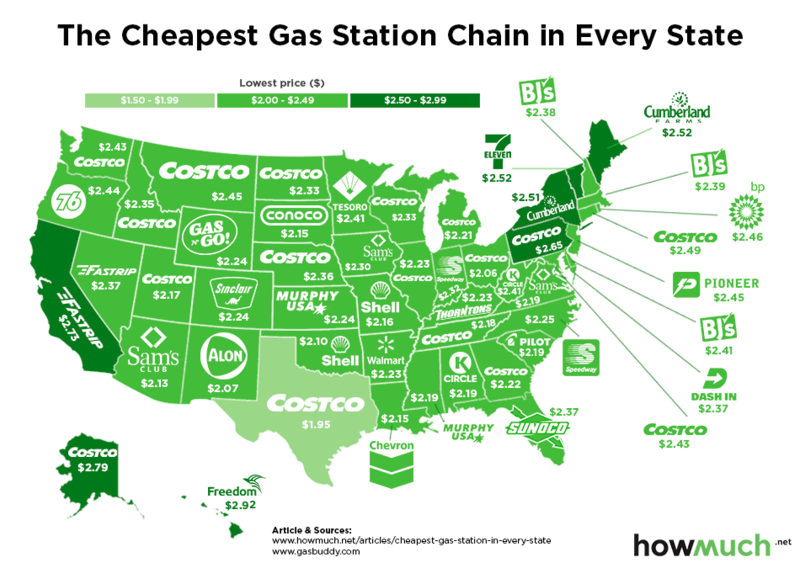 Costco appears far more than any other company as the chain with the lowest gas price across the 50 states. But Costco doesn’t offer the same prices in those states. For example, Costco is the chain that offers the lowest gas prices in Texas at $1.95 per gallon, which is the cheapest price in the country. At the same time, Costco is also the chain that offers the lowest price in Connecticut at $2.49 per gallon, which is much higher than Texas and nearly falls into the highest price tier. Various gas chains are represented on the map, but not all offer the same prices. But don’t be fooled by Costco’s prevalence on the map. Costco still must raise and lower prices based on the relative competition for gas services in those states. If you want to save money on gas costs, you’ll have to consider both the state and the gas chain.